A participant recalls a story from her work life during the "Hammond at Work: Live!" 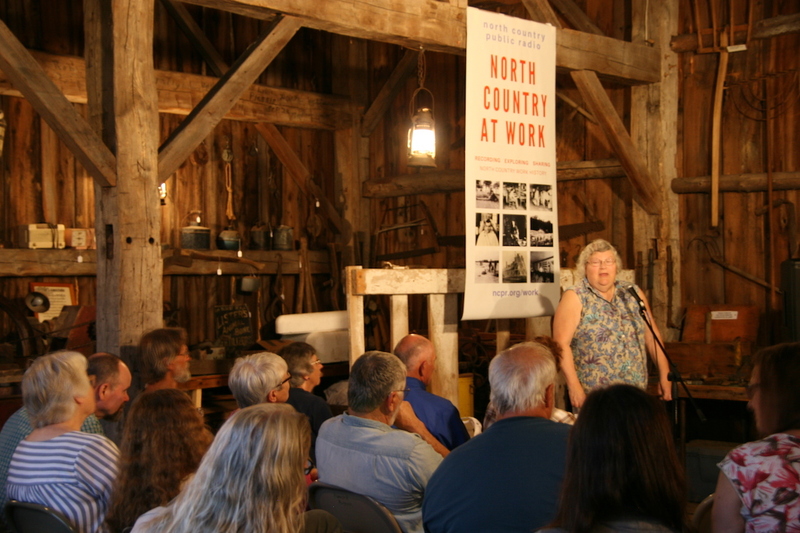 storytelling event in August 2018 in Hammond, N.Y., sponsored by North Country at Work. Claire Mendes recalls connecting with a man in the Adirondack Mountains who initially had doubts about participating in a North Country Public Radio outreach initiative. Mendes was recording interviews last September in Keene Valley, N.Y., for North Country at Work. The engagement project collects archival photographs and stories on the occupations that have shaped regional economy over time — from logging to farming, boat-building and tourism. Mendes is outreach coordinator for the initiative, now in its third year of creating coverage and community events from photos and oral histories of the working lives of locals. When the man turned out for an event to share photos, Mendes recognized him by name. He had posted “a couple negative comments about the ‘mainstream media’” on NCPR’s website, she said. Meeting him in person at the Keene Valley Library, “I talked to him about his work; he makes rustic furniture,” Mendes said. The two got along well. She invited him to the station’s local story slam, where producers would record speakers. He showed up. North Country at Work (aka NC@Work) was a finalist in Current’s Local that Works competition that highlights innovative and replicable work. The NCPR engagement initiative exploring the history of work in the Adirondack region of upstate New York has grown in scope, staffing and funding over the past three years. The NCPR team now produces community events, including receptions tied to installations of local photography, as well as storytelling evenings. To make the archival photos accessible to digital audiences, NCPR has also developed an open source platform, Diviner 1.0, scheduled for beta launch soon. It’s a white-labeled version of the project’s easily searchable website. The National Endowment for the Humanities funded its development, an investment that will allow other nonprofits to easily share archival materials with the public. Rocco came up with the idea at a public radio conference several years ago, during a session on inclusive outreach. She developed the concept for North Country at Work with help from Dale Hobson, digital managing editor. Its thematic focus on work life allows NCPR to connect with people and communities across its coverage area. 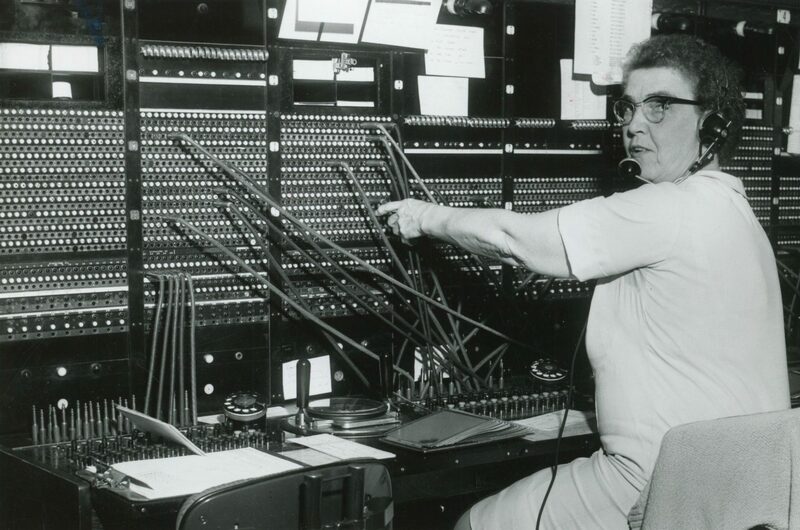 Erma Scholl works a switchboard in 1971 in Old Forge, N.Y. North Country at Work is collecting and archiving such photos, with assistance from partners including local museums. The concept of scanning is “foreign to a lot of people,” Mendes said. The NCPR team is also better able to anticipate differences among infrastructure and culture across communities. “Hammond has a close-knit group that often visits its historical society, so a lot of people come there,” Mendes said, making that community center a natural spot to host an event. But in Lake Pleasant, “there’s not a place like that, that people are connected to.” They partnered with a library in that community. One local partner clued them in that the Bargain Hunter newspaper was the best place to advertise in Cranberry Lake, N.Y. That drew a crowd of 45 — out of a population of 200. Libraries and museums also host the photo installations that began last year. After collecting archival photos in a community, the NCPR team enlarges 20 or more photos and mounts an exhibition, then invites the community to a reception when it opens to the public. Rocco said the enlarged photographs have become part of several museums’ permanent collections. For each exhibit, NC@Work also provides CDs of interviews recorded from that community. Work-oriented storytelling evenings also started in 2018. The idea for those grew out of NCPR’s popular monthly Howl Story SLAM a storytelling competition with rotating themes. NC@Work team members recruit potential participants at the scanning events, and local partners provide references for good local storytellers. “We’d line up five or six people and encourage others in the audiences to talk as well,” Feiereisel said. The NC@Work season culminated in December with a big story slam focused on work life, held in a theater in the Adirondacks community of Tupper Lake, N.Y. “It was a super snowy day; we were scared no one would show up,” Feiereisel said. But more than 100 people turned out to the venue, which seated around 70. The chilly winter weather in New York State somewhat dictates the “season” for the project, from April through December. The team is now working on scheduling this year’s events. It’s also readying Diviner 1.0, the open-source platform for displaying archival photos, for beta testing by May. NEH suggested that developer Graeme Hoffman“white label” the platform so other public media organizations and nonprofits could rebrand it for their own use. Diviner 1.0 is also open-sourced so other developers can work with the code. Once in use, the platform and its tools will allow organizations to archive and catalog multitudes of photos, videos and documents, and public users can easily search the content. Also, “we like to think it’s responsive and encourages exploration of material, and doesn’t require the user knowing what they’re looking for to have fun,” she said. “Four or five” nonprofits nationwide will help beta test the platform starting this spring, Rocco said. In addition to several stations (still to be announced), beta test sites include the Wisconsin Humanities Council and the Clinton County Historical Association in Plattsburgh, N.Y.
As for this year’s NC@Work, plans include several visits to Akwesasne, a community in Mohawk territory where New York State, Ontario and Quebec intersect. The local partner there is the Akwesasne Cultural Center, which houses a library and museum.